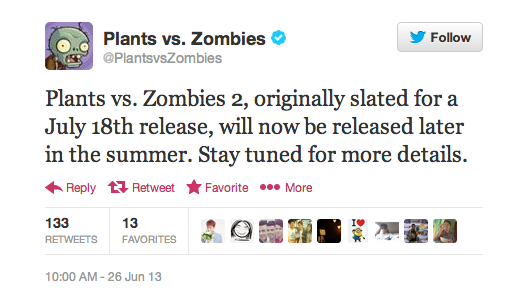 The name of the game may be Plants vs Zombies 2: It’s About Time, but PopCap is asking for a little more development before they release their game. The game that was first promised in “early summer” was officially announced last month with a release date of July 18, but today PopCap took to Twitter to announce that release schedule isn’t going to be made. To say that people have been waiting anxiously for this sequel would be quite an understatement. PvZ is one of the best selling mobile games across multiple platforms, but PopCap can’t seem to push this game out the door. All we are left with after this latest delay is “later in the summer.” Who knows when that will be.